This personalized cribbage board is both a handsome heirloom and a memorable way to bring the family together. 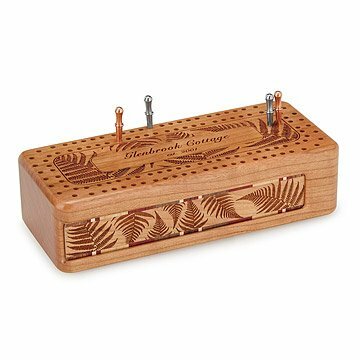 With a decoration inspired by nature, and on-board storage inspired by utility, this personalized cribbage board is both a handsome heirloom and a memorable way to bring the whole family together. Handmade by designer Ron Flint, these finely crafted cribbage boards feature a laser-etched woodsy fern motif, and can be customized with a meaningful message or dedication. The side sports a beautifully-crafted sliding door concealing card and peg storage. It's a self-contained, functional work of woodcraft, perfect for taking your game on the go, whether your family is jetting off on vacation or you and your partner would like a little date-night entertainment. Handmade in the San Juan Islands, Washington. Don't know how to play cribbage? Neither did we! So we studied up, played some games, had tons of fun, and wrote about it on our blog. Click here to learn how to play! Ron Flint was educated in graphic design and fine arts at WWU in Bellingham, WA. He then spent the past 30 years as a professional in broadcast and non broadcast advertising, specializing in film, video and print mediums. Living and working in the San Juan Islands of Washington State has provided many forms of nature-based inspirations. Ron's lifestyle and close working relationship with creative and talented artists has lead to the diverse variety of nature and pattern-based designs you see reproduced on most of their handmade wood products. The engraving will be a lasting reminder of my son's hard work and in a game he enjoys. Or so said my parents. The product is absolutely beautiful, especially with personalization. My mom and dad were thrilled. They're huge cribbage players, and go camping in their RV often. I thought this would be perfect for that, since it's so compact, and that's the first thing my mom said - Great for the camper! It comes with everything you need, including the cards. Highly recommend. Very nice and compact. Easy to pack and take along. Nice to look at. Only issue would be if you're a beginner there's no clearly marked start/finish point. Otherwise, very nice addition.